Fusion veteran Jean Jacquinot, former director of JET and of CEA's fusion research department, welcomes approximately 40 Erasmus and French Master's students to ITER. The European program Erasmus Mundus, which aims at strengthening European cooperation and international links in higher education, awarded 18 scholarships this year to students (one third of them non-European) enrolled in Fusion Masters courses. Along with an equal number of fusion students from the French Master's degree program in Fusion Science, the Erasmus Mundus students made a stop at ITER last Monday 11 February on their way to the laboratories where they will be doing two weeks of hands-on work. Students will take part in experiments and data analysis at neighbouring Tore Supra and, remotely, at ASDEX and other European fusion installations. 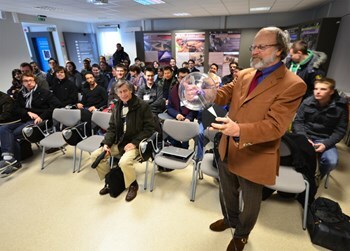 The students were greeted at the Visitors Centre by ITER Director-General Osamu Motojima and fusion physicist Jean Jacquinot, who was instrumental in creating the French Master's degree program in Fusion Science six years ago. To this day, some 200 students have earned the Master's degree in Fusion Science delivered by several French universities and Grandes Écoles.